When we think of healing, what generally comes to mind? Going to a doctor? Taking some prescribed medication? How about psychotherapy for mental and emotional problems that affect so many people nowadays? More and more people are exploring alternative forms of healing like chiropractic, acupuncture, massage, and nutritional counseling that address more than just physical symptoms. These non-invasive approaches focus on releasing a person’s natural ability to heal themselves, not only on a physical level, but mentally, emotionally and spiritually. Another alternative method of healing is through the use of sound. Sound healing has been around for centuries. It was used in the ancient civilizations of India, Tibet, Europe and Africa. The Australian Aboriginals and Native American Shamans use vocal and repetitive sound vibration with instruments created from nature in sacred ceremony to adjust any imbalance of the body, mind and spirit. Many claim that healing through sound was also used in ancient times by the priests of ancient Egypt and in Atlantis. The Tibetans are particularly well known for having mastered sound, not only through the use of chanting as the foundation of their spiritual practice, but as well as with their specific use of bells, chimes and metal bowls to heal people physically, mentally, emotionally and spiritually. Sound healing works, because like all matter, the human body is not solid. It is energy held together by specific frequencies. Sound vibrations of specific frequencies have a very powerful effect on healing our body because when we are vibrating at an “off” frequency due to the stresses of life, our body gets off balance, resulting in pain and other symptoms. If we remain in this state, eventually we develop chronic pain and other health problems. 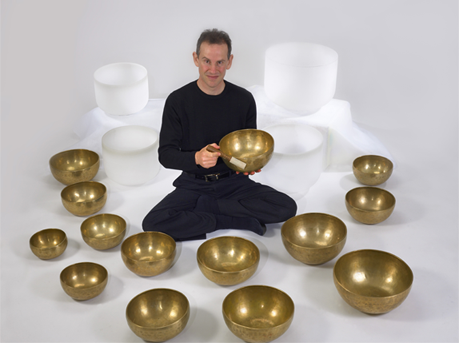 For the past 20 years, Dr. Hans has been using two of the most powerful instruments of sound healing along with chiropractic treatments; Tibetan Metal Bowls and Quartz Crystal Bowls. Both Tibetan and Crystal bowls produce strong vibrations that have a profound healing effect on our body and work directly through the central nervous system. Not only can these sound vibrations be heard, but can be felt very deeply in our body. The results are profound. They help calm the mind and induce a deep state of relaxation very quickly, which is necessary for the body to begin the healing process. The bowls also unblock regions of stress in the body by restoring a normal and healthier frequency to the areas in question, resulting in pain reduction and a greater mental, emotional and spiritual connection. 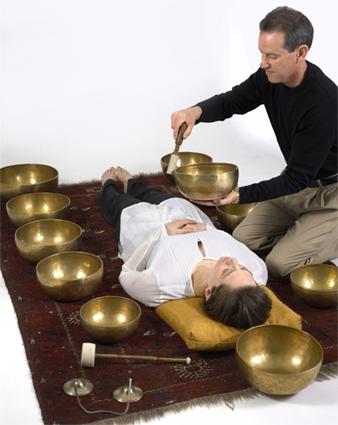 As you can see in the pictures below, the Tibetan Metal Bowls are placed directly on the spine, one at a time, and the Crystal Bowls are played off the body by a few centimeters, with the person either laying down on the side or sitting. 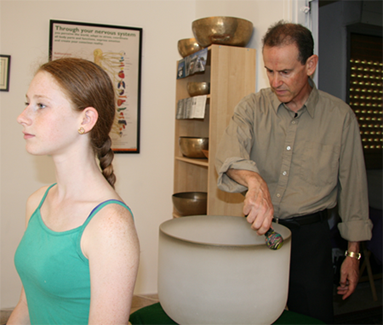 Dr. Hans uses the sound healing bowls during his chiropractic treatments but offers additional, more intensive vibrational healing sessions using both the Tibetan and Crystal bowls. For more information contact his office. Dr. Hans has 25 years of experience successfully treating people of all ages who suffer from these conditions without medications or surgery! Why Is My Back Hurting Me?